Marcelle De Michael: A paradigm shift is taking place throughout the world focusing on higher consciousness, a sustained, loving lifestyle with spiritual practice, including meditation and yoga. A worldwide movement is transitioning humanity toward an integral balance of intellect and spirituality, transcending the drama of ego, fear and duality. How does this shifting paradigm affect and appear in your work? 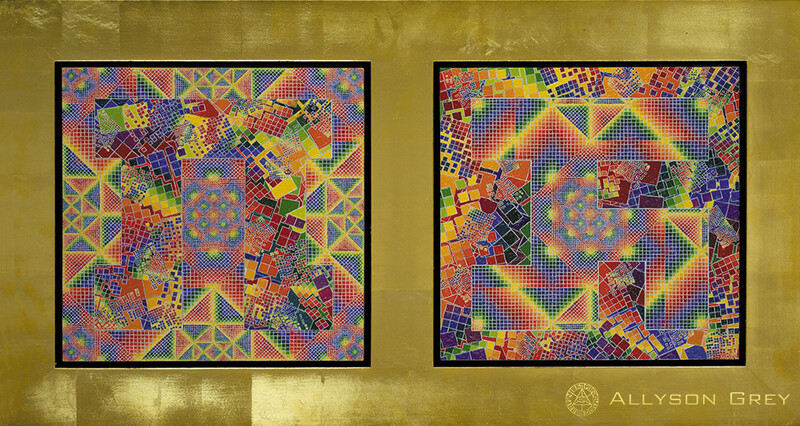 Alex Grey & Allyson Grey: On June 3rd, 1976, we sacramentally ingested a high dose of LSD and simultaneously glimpsed the Universal Mind Lattice, the Jewel Net of Indra, Nirvana, Heaven, Liberation, an experience of interconnectedness through a web of cosmic intelligence, a view through the mystic eye, the pulsating, roiling channels of light forcing through all beings and things. Being a node in the network of infinite light, the self was connected with all other selves made entirely of the same force. That moment in our lives was a game changer. We knew that translating and sharing that life altering portal would be our best shot at furthering the cause of human transformation toward a more loving, just, eco-conscious, and spiritually awakened world. 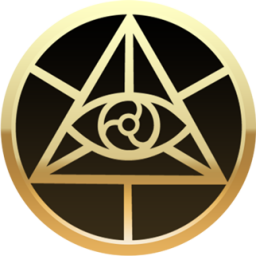 The first Sacred Mirrors completed in 1979 were exhibited that year at the International Transpersonal Conference in Massachusetts, U.S.A. Millions have resonated with the integral worldview the imagery and commitment evident in the artwork we have produced for forty years. Alex's Sacred Mirrors series presents a vertical dimension of the self, portraying body, mind and spirit. The nineteen paintings and two etched mirrors reflect the individual first as a material world object with anatomical systems, racial and gender characteristics, then as a vessel of transcendental energy and Divine archetypes. Allyson's Chaos, Order and Secret Writing describes a world view of three elemental realms. Chaos is order plus entropy, otherwise known as the material world. Order is the bliss realm, the vistas of fountains and drains of love and light. Secret Writing represents the sacred language of creative manifestation. When thoughts become things they come out as symbols. CoSM, Chapel of Sacred Mirrors, is our co-creation with our community both near and far. Everywhere we travel all over the world, our community comes out to benefit the future of CoSM. Building CoSM, temple grounds here in New York, is the co-creation of a loving global community. Marcelle: For decades. your visionary artwork and teachings have been represented worldwide. Talk about your own use of time and space as creative tools to manifest a higher vision? Alex & Allyson: Our lives, including all of our time and space, are dedicated to the mission of CoSM, a collaborative social sculpture. The mission of CoSM is to build a temple of visionary art to uplift and inspire a global community. MDM: The Chapel of Sacred Mirrors began in your Brooklyn art loft and then moved in 2004 to a 12,000 square foot loft in Chelsea, New York City's club and gallery district. In 2009, CoSM left the city for a tranquil country setting, a 40-acre retreat center sixty miles up the Hudson River. In just five years, CoSM in the Hudson Valley of New York has gone through massive restorations and building. Workshop, living and exhibition space offers visionary art and spiritual ceremony to Love Tribe community visiting from all over the world. Tell us of your future vision of CoSM in relationship with nature and the cosmos through art, spirit and creativity? Alex & Allyson: Building Entheon, a sanctuary of visionary art at CoSM, has our attention now and for the next couple of years. It will be a sculpted building created by adapting Alex's drawings to computer models and then computer print outs twenty feet high. An inspired installation will display important works of contemporary visionary art and many of our best loved paintings including all 21works in the Sacred Mirrors Series and their ten accompanying angels. CoSM is now open for visitors four days each week and our guest house is open for overnight guests 365 nights a year. The guest house is filled with art and is where we hold Full Moon Ceremonies and Celestial Celebrations, Art Church and Visionary Salons. A radically welcoming church, CoSM hosts weddings, baby blessings and memorials. In this country setting, we have a fire circle at evening events whenever possible, a Wisdom Trail with a labyrinth, shrines and many artistic features created by invited artists and by nature itself. Marcelle: Contemporary seekers and artists including Ken Wilber, Russell Brand, Thomas Hübl, Naamleela Free Jones and Annette Kaiser offer a new perspective on the true capacity and possibility for humanity. What is your teaching? Alex & Allyson: God is the divine artist and the universe is the evolving masterwork of creation. We are each a microcosm of the web of creative intelligence. The inevitable consequence of love is the building of temples. Surrender to Love. 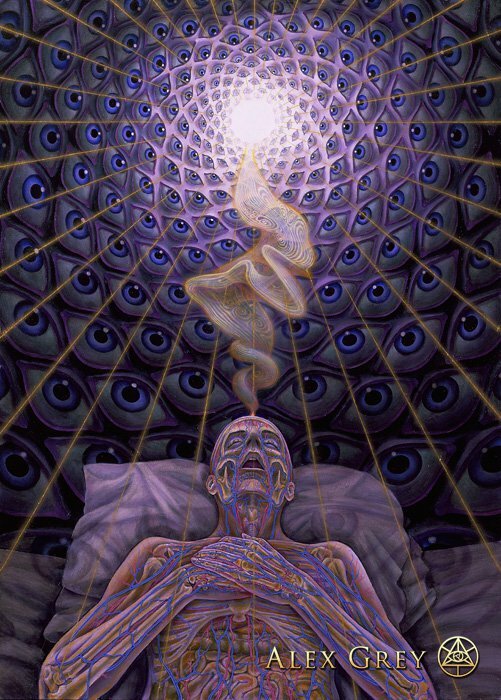 The book Art Psalms (by Alex Grey) is CoSM's liturgy. The mission of CoSM is to build an enduring sanctuary of visionary art to inspire and evolve the creative spirit. Marcelle: Where does the soul/spirit migrate after death? Alex & Allyson: When we die our presence is essentialized into a spiritual body that carries our consciousness to different dimensions. In one dimension, we are a node in a vast network of torroidal energy balls, fountains and drains of light that is love. Marcelle: What artist, musicians and authors are your latest inspirations? What spiritual teachers influenced your path? Alex & Allyson: Having shared a studio for 38 years, we have been most influential to each other's art, by far. We read totally different books and learn from each other. Allyson: The I Ching, Book of Runes, 49 Laws of Power by Robert Green -- I use these like oracles to give perspective to daily life and concerns. Smart Tribes by Christine Comaford-Lynch distinguishes the characteristics of the best working teams and strategies to becoming one. Funny Times, a monthly humor compilation, Jon Stewart's Daily Show and National Public Radio is where I like to get my news. Some of our greatest teachers are the members of our family and friends at CoSM and Love Tribers we meet throughout the world, those who help and guide us toward a collective vision of temple grounds in the Hudson Valley of New York. We had an unforgettable time in Munich a couple of years back and send our loving regards to all our spiritual creative friends in Germany.